From 7 September to 7 October 2017 the nomadic gallery Esther Verhaeghe is installing itself in Hangar to present a previously unseen monographic exhibition of work by the German artist Martin Streit, a first in Belgium! Entitled Poesy of Light, the exhibition unveils some thirty recent works by the artist, including photographs taken with a camera obscura (see below) as well as oil paintings on canvas. Martin Streit studied painting at the Academy of Fine Arts in Münster and later in Düsseldorf. In the last few years this German artist born in Koblenz in 1964 has combined the use of photography to a more or less equal extent with his practice of painting. His work was first shown at Hangar during February and March of this year in the exhibition Resilience. Martin Streit initially used photography as a support for his creative process during his residency as an artist at the Cité des Arts in Paris, when he would brings back objects found in the flea market and photograph them in black and white to create still lifes in his studio. His painting revolves around the object and the light. How is an object to be structured – architectured – in the space of the canvas and in what way does light play a primary role in this process? Faces and profiles, angles and plane surfaces of objects are all in their way pretexts for making the light vibrate. Martin Streit began using a camera obscura in 2010. The camera obscura is an objective optical instrument that projects light through a small hole onto a flat surface, as a means of obtaining a two-dimensional image very close to that produced by the human eye. Painters used it before the discovery of methods for fixing the image resulted in the invention of photography. The camera obscura provided the artist with an exact but upside-down image of the view that he wanted to reproduce. Leonardo da Vinci was one of the many artists who used this process as an aid to faithfully reproducing the scene in front of them. Streit constructed small boxes to serve as a camera obscura in order to experiment with its possibilities, and in 2010 he was invited by the painter Georg Schmidt to exhibit at the Field Institute in Hombroich, Neuss. The space at his disposal there was strange: a corridor that was almost a tunnel, 48 metres long by 2.5 meters high. He then opted to create a camera obscura almost as long, which people can get inside. The first picture he took with this camera produced an effect – with which he was thrilled – surprisingly similar to his paintings. Since then the artist has gone on improving the process, achieving results that continually delight him, and he now creates many of his works with this resource. In 2014, Streit set up his Lichtkammer in front of Cologne Cathedral and proceeded to take a large number of photographs of its main façade at all hours of the day, with results that bring to mind the different versions of Rouen Cathedral painted by Monet, indulging his passion for light. Since then Martin Streit has installed his Lichtkammer in many different places, to capture views of the town or city, architecture, still lifes, people: what interests him most about the silhouettes – walking, moving – is the link the establish with the setting. All of the images he offers are blurred, smudged or clouded. He loves this blur effect generated by the camera obscura, and cultivates it. 'I like it not to be concrete, not too descriptive. There's no need to say too much about reality. It's like in a sweet dream,' he has said. 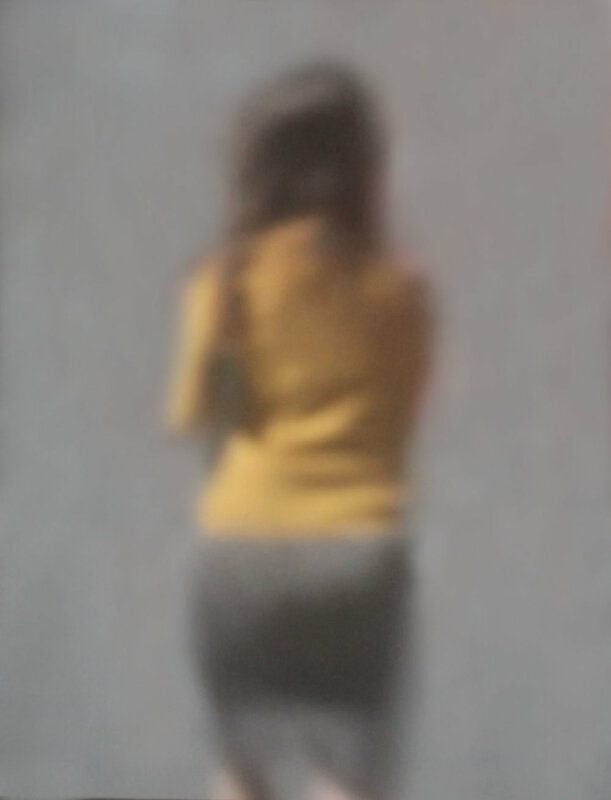 The blur that Martin Streit offers us renders his images fragile, fleeting and poetic. In front of each one, the eye seeks to appraise the situation, but finds itself thwarted. This figure standing against a greyish ground is not recognizable. We don't know who he or she is. This other silhouette walks with a firm step, diagonally towards the outside of the frame, against an indefinable background. She has her back to us, or her face is a blur. Everything seems swathed in fog. This shifts and tilts our perception. It could be us, or some forgotten person who has come back to us in memory. A poetry insinuates itself. Nothing is permanent. Once the moment of vision is gone, everything can disappear. Or flee into oblivion. 'She has a captivating smile and a glance that sparkles between two absences where, seemingly immersed in itself, she reveals this sensitivity that expresses itself in her trajectory. With the opening in Ixelles of the gallery that shares her name, Esther Verhaeghe opens the doors of her aesthetic universe to us in a spirit of integrity and warmth, vibrant with creativity.